Guadalupe Garcia was born in Sonora, Mexico but was raised in California in the San Luis Obispo area. He apprenticed in a saddlery shop and eventually moved to Elko, Nevada and opened his own saddlery business. He had seven children and his sons Henry and Les took over the company after his death. The Garcia Saddlery in Elko provided a place where many famous makers would learn and hone their craft and at any time Garcia might employ as many as 20-30 craftsmen. 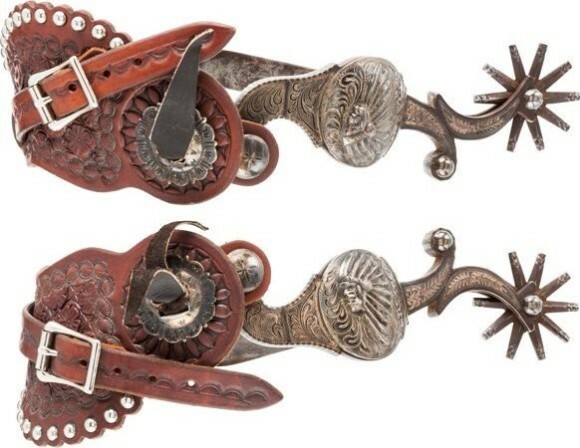 Garcia was famous for creating a prize-winning saddle at the 1904 World’s Fair in St. Louis, and the Garcia Saddlery sponsored and organized a Rodeo in Elko as well. Most Garcia bits and spurs are marked as GS GARCIA ELKO NEV or GSG HAND MADE, some also will have an extra letter stamped to denote which worker in the shop actually made the piece as well. G.S. Garcia’s shop employed many of the top silversmiths, spurmakers, and bitmakers of the time including Paul Adams, Ruben Aldaco, Joe Alines, Joseph Ames, J.J. Bernal, Adolph Biancani, Steve Clarke, Antonio Dominguez, John Estrada, Jose Figueroa, Manuel Gil, Raphael Gutierrez, Dean Harrison, Emanuel Hernandez, Alsalio Herrera (was the master bit and spur maker who trained many of the others), Louis Jackson, Thomas Jayo, Barney Kerlein, Susie Mcdonald, Mike Morales, William Phillips, David Rojas, Martin Silverio, and Jose Valenzuela. 1894 – Moves to Nevada and begins work where his company employs many other master spur and bit makers. Many people this that by this time he was doing very little work himself as he was running his business and working as a Rodeo promoter. Click here for information on Garcia Maker’s Marks.